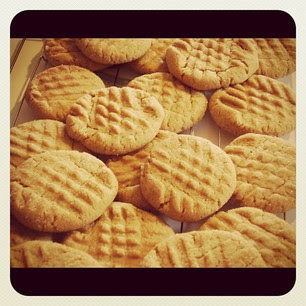 Go Bake or Go Home: Peanut Butter Cookies-- 2 Ways! Peanut Butter Cookies-- 2 Ways! I've got 2 peanut butter cookie recipes for you this morning! Wow! It's always nice to have options, isn't it? The first recipe is a gluten free, brown sugared peanut cookie. The second is a spelty, maple blend cookie! Cookie #1 - Flourless Peanuty Nutter Butters! Pictured above, is the first cookie- The Flourless Peanuty Nutter Butter. It's all like "Hi! I'm gluten free, melt-in-your-mouth delicious! I'm also flaky, tender and even crispy!" hehe Love talking cookies. But if you are so inclined to use the natural variety of peanut butter, go right ahead! It won't make much of a difference (in the cookie at least), but think about slightly increasing the amount of sugar and salt in your cookies. Kraft peanut butter has added sugar and salt. Don't worry to much about these changes though, you can always make the batter according to the recipe and then adjust the cookie dough for taste and texture at the end! Also, you can't really over mix these guys since they are free of glutinous gluten. OK everybody- here are the recipes! Sift in the flour of your choice, baking powder and salt. Spoon large dollops of batter onto the cookie sheet and lightly flatten using the palm of your hand. These guys will spread. I flatten these cookies to about a 1/2" thick to get very thin cookies which I am a fan of. If you want thicker cookies, barely flatten them or refrigerate your cookie dough before spooning onto the cookie sheet. That should help them keep their shape. Before baking, sprinkle the cookies with the crushed peanuts (if using), cinnamon and vanilla powder. Bake for about 11 minutes or until the bottoms are slightly golden brown. They will fall apart when they warm, but will solidify when cooled completely. So leave them on the cookie sheet to cool completely. Don't transfer to a wire rack to cool unless you want cookie crumbs instead of whole beautiful cookies! They take a while to set. In a large mixing bowl, whisk the spelt flour, oat flour, flax or chia seeds and salt together to remove any lumps. In a separate smaller bowl, mix the peanut butter, maple syrup, melted coconut oil and vanilla together until smooth. Pour this peanut mixture into the bowl of dry ingredients and mix well with a silicon spatula. Roll dough into 1 or 2 tablespoon-sized balls and place on cookie sheet. Gently press each piece of dough with the tins of a fork to create a criss-cross pattern. Bake for 10-12 minutes or until cookie bottoms are slightly golden brown. Remove from oven and allow to cool for a few minutes on the cookie sheet, then finish cooling on a wire rack. Switch the peanut butter for almond butter! Throw in a couple toasted, slivered almonds and a little almond flour too. Some almond extract in place of some of the vanilla extract would be be amazing! Same idea as above, but use hazelnut everything instead! Hazelnut flour is to die for! Chocolate chips too? Use a little tahini (the pourable kind) and throw in some sesame seeds and lemon zest too! 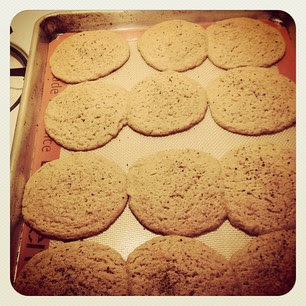 A little oat bran or oat flour would taste great with sesame. Use cashew butter and finely chopped toasted cashews. Sweets From The Earth makes a mean cashew cookie and they use silken tofu in their recipe! So you could always try that too! Last but not least, in the first recipe, replace the flax seed slurry with 3-4 Tbsp of smooth applesauce!